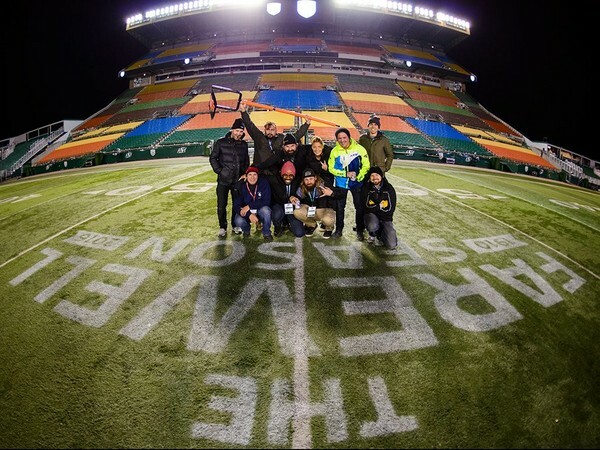 Caption: The last ever photogs group photo after the last Saskatchewan Roughriders CFL game ever at old Mosaic Stadium in Regina, Sask., Canada. [back row, left to right, Mark Taylor (Cdn. Press), Matt Smith (Reuters), Troy Fleece (Post-Media), Johany Jutras (CFL), Derek Elvin, Derek Mortensen (Roughriders/Electric Umbrella), front row, left to right, Brent Just (Getty), Arthur Ward (Roughriders), Liam Richards (Roughriders/Electric Umbrella), Michael Bell (Post-Media)].